If you would like a test version of your website to fine tune themes/templates, plugins, layouts etc, you can do exactly that with WPX Hosting's new Staging Area! Unlike other hosting companies' Staging Areas, the WPX Staging Area allows you to merge your Staging site with your Live site. 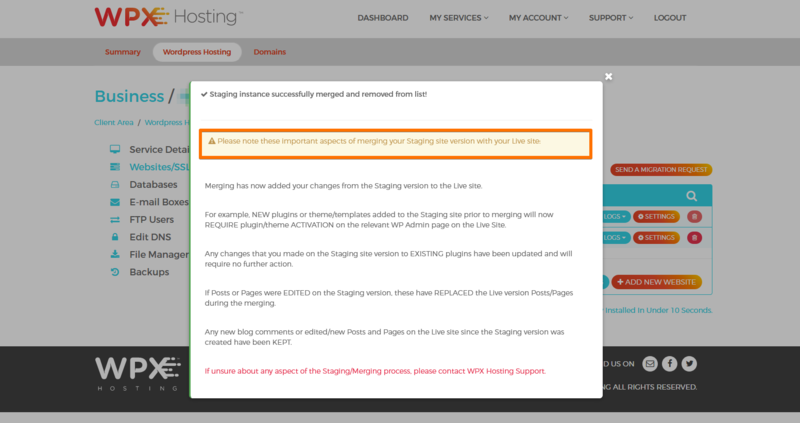 This means that any new blog comments or Post/Page changes on the Live Site, since the Staging version was created, will be kept and only the other changes made on the Staging version are added to the Live site (more details below). NOTE: 1 staging area takes up 1 website slot. For example: If you are on a Business plan, you will have 5 website slots. If you want to create a staging version of 2 existing websites, you will need 4 website slots; 2 website slots for the staging areas, and 2 for the existing parent websites. 2) The staging area does not work properly with Multisite installations. Step 3) Your new staging site can take up to 1 minute to be created because a complete copy is made of your live site. an A Record pointed to the staging subdomain (e.g. 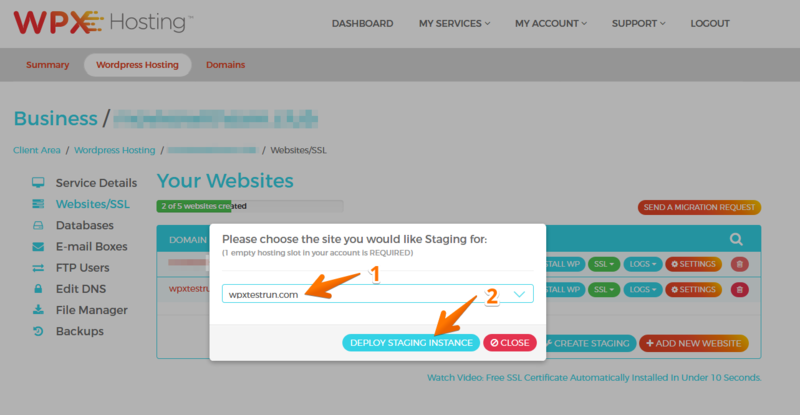 staging.YOURDOMAIN.com), or the nameserver of the parent domain to be pointed to our server. You will then see a message to let you know that your Staging version has been created! Step 5) Once your Staging instance has successfully been created for the chosen domain, you can then access your Staging area. Step 9) Merging your Staging version with the Live version will automatically keep any new blog content (including comments and posts) on the Live site however, merging will add any other changes from the Staging version to the Live site (new plugins, theme/templates, or changes to existing plugins). NOTE: If Posts or Pages are edited on the Staging version, these will replace the Live version Posts/Pages during the merging. 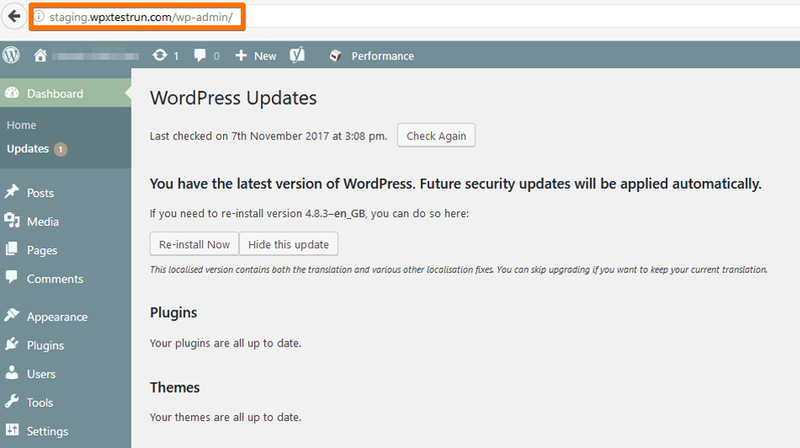 Important: New plugins or theme/templates added to the Staging site prior to merging will now require plugin/theme activation on the relevant WP Admin page on the Live Site. Your live website has now been updated! version, if you need it. VERY IMPORTANT: In order to see the updates and changes on your live website, you must clear your browser cache and refresh the page. You can do this by pressing Shift+F5, or click on the Reload Current Page button on your URL bar. 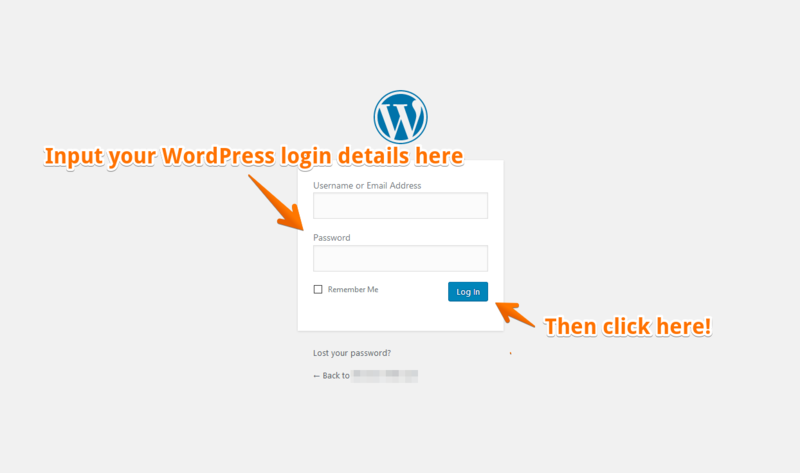 Here's what Matt Woodward WordPress hostings' test reveals (check out his results). You can also learn more about our discounts (check them out here). Haven't visited our YouTube channel yet (you can watch our customer reviews here). Find details how to use test versions of your website. A video walkthrough on how to use WPX Hosting's new Staging Area (and our WordPress hosting in Germany, please check out here). Additional information about our service in New Zealand. You can also read about the simplest ways to massively accelerate your WordPress website (based on 5 key areas here). More reviews about the excellent WPX support - find on Trustpilot. Read the latest WPX news on our Facebook page. For more details about our Staging Area visit our UK website. WPX Hosting is in Brazil now!